Having access to transportation changes lives and we believe everyone deserves access to transportation. I was inspired by my brother. He is an extremely talented local culinary expert and the executive chef at a fine dining restaurant about 25 miles north of Oklahoma City. He's a very hard worker and contributes to society in positive ways. However, he recently lost his driver's license due to a DUI. Public transportation is nearly non-existent in Oklahoma City so he depends on other people to take him to and from work. It's not a great situation for him or anyone who has to transport him. Chefs don't make a lot of money so he cannot afford taxis or Uber. He loves his job and he is the type of person who deserves access to transportation and I felt like GiveRide was the best way to make that happen. There are also many lower income people who have warrants for their arrest due to unpaid fines for parking and jaywalking. More often than not, this is because they do not have access to transportation to get them to the courthouse to pay. GiveRide would at least give them the opportunity and hopefully improve their lives. 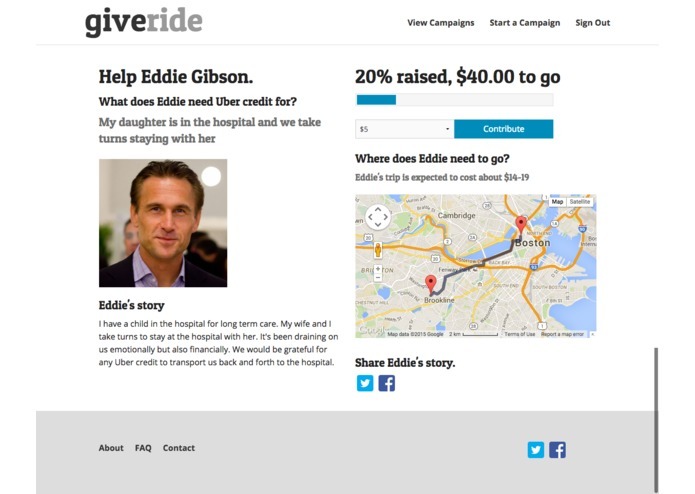 GiveRide's target users are anyone who contributes positively to society but cannot afford the costs of transportation, whether that is financial costs from buying a car, or the time costs from taking public transportation. 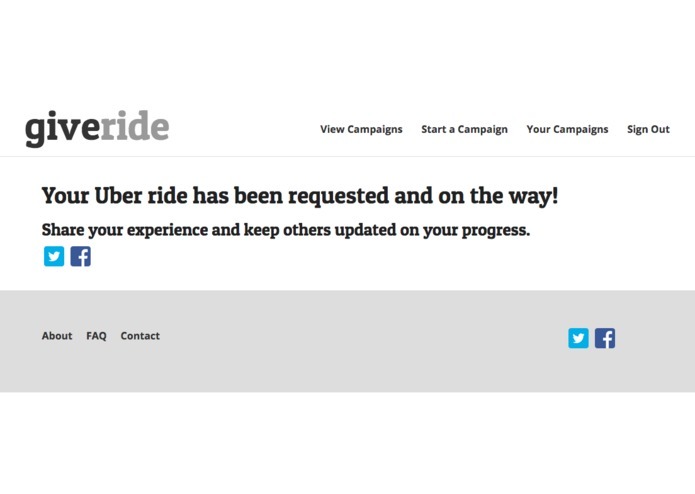 I'm most proud of using Uber for a non-profit idea. There's nothing more rewarding than using technology in this kind of capacity. 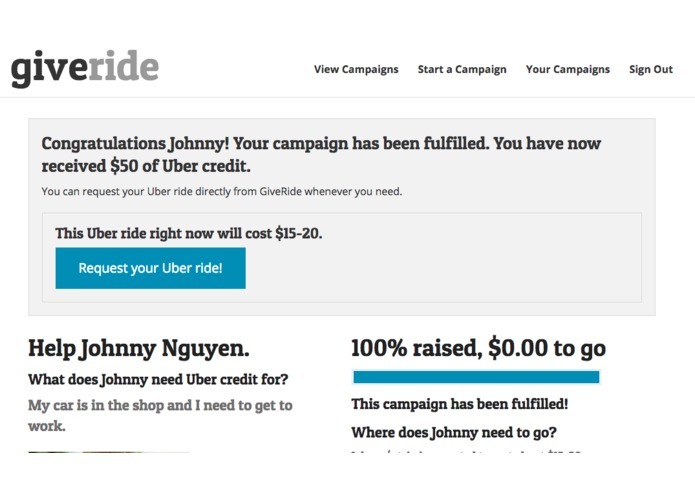 The next feature I'm working on for GiveRide is the ability for a contributor to fulfill a ride campaign by picking up the rider on their Uber route. 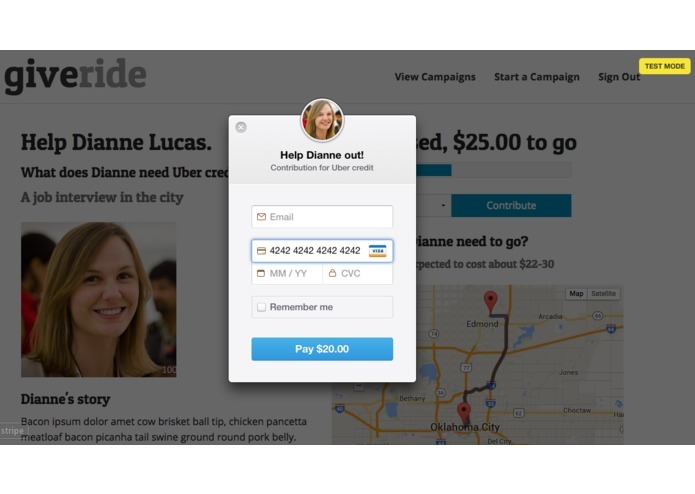 This bypasses the entire gifting piece and allows for person to person interaction. This is a brand new application I built specifically for this hackathon.